Doctors - Jensen Optometrists, P.L.L.C. Clark J. Jensen, O.D., F.A.A.O. Dr. Clark did his undergraduate studies at Simpson College. He obtained his B.S. in Health Services in 1974 and Doctor of Optometry in 1976 at Pacific University. In 1997 Dr. Clark was appointed Adjunct Assistant Professor at the Pacific University College of Optometry. Dr. Clark joined Jensen Optometrists in 1976 and has been in practice for 40 years. He was Contributing Editor of Optometry Today, a professional journal, and has published articles in Optometry Today, The Contact Lens Spectrum, and The South African Optometrist. Dr. Clark loves to teach and has done so as Senior Lecturer at University of the North, Sovenga, South Africa. He was also Director of Optometry Clinics while at University of the North, and has given continuing optometric education lectures within the United States as well as South Africa. He is a member of the Iowa Optometric Association, American Optometric Association, a Fellow of American Academy of Optometry, past President of the Heart of America Chapter of the American Academy of Optometry, Volunteer Optometric Services to Humanity (VOSH)/Iowa, and is the Iowa Representative on the Vision Service Plan Regional Professional Committee. Most recently has passed his examination to become Board Certified by the American Board of Optometry. Dr. Clark's community involvement includes being a current member of the Grinnell United Methodist Church, Grinnell Lions Club, and a past President of the Grinnell Jaycees. Dr. Clark served the Grinnell Regional Medical Center Foundation Board, and was a past Chairman on Grinnell Regional Medical Center's Board of Trustees. Dr. Clark continues to speak at continuing education seminars as well as educate his staff and patients. 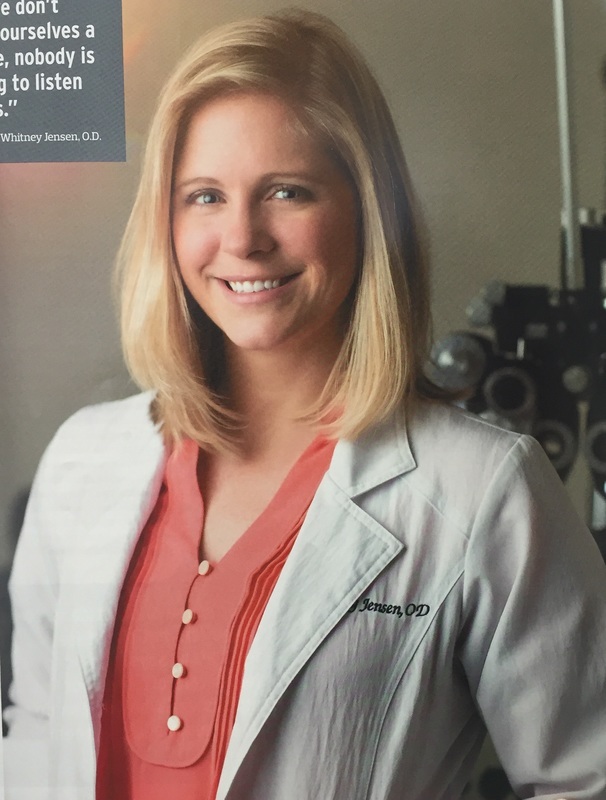 Dr. Whitney Jensen joined the Jensen Optometrists team in July 2015. She graduated from the University of Missouri, St. Louis College of Optometry in May 2012. She worked in Des Moines after graduating. While in Optometry School she was a member of SVOSH (Student Volunteer Optometric Services to Humanity) and participated in a mission trip to Honduras. She was also a member of AOSA (American Optometric Student Association) and is currently a member of the IOA (Iowa Optometric Association) and AOA (American Optometric Association). She enjoys advocating for Optometry through various grass roots efforts and organizations and was featured in the March 2016 AOA FOCUS magazine. She attended the State Legislative and Third Party National Conference in Denver in October 2015 as an Iowa representative. She is an InfantSEE provider and certified in fitting CRT (corneal refractive therapy) lenses. Dr Whitney also received the 2017 Young Optometrist of the Year Award from the Iowa Optometric Association. Dr. Whitney moved to Grinnell with her husband, Heath, in February 2016. She enjoys coaching the Parks and Recreation Swimming Team and she is serving on the Grinnell Downtown Planning Committee, which is designed to strengthen the downtown by retaining and assisting current businesses to reach their full potential and launching new efforts that strategically improve the downtown. Dr. Kelly (Freeborn) German is a native of Lynnville, Iowa. She graduated from Lynnville-Sully High School, then earned her B.A. in Biology at the University of Iowa, and went on to accomplish her Doctor of Optometry at the University of Missouri-St. Louis in 2016. She started her professional career at a clinic in Boulder, Colorado before returning home to join Jensen Optometrists in April 2018. She completed her internship training in a variety of specialties including ocular disease at Wolfe Clinic in West Des Moines, and pediatrics at the St. Louis University pediatric ophthalmology clinic. Additionally, she also received an award from Allergan for her understanding and explanation of care and treatment of dry eye. She has a particular interest in fitting contact lenses and finding the perfect lens to fit her patients’ lifestyles. Professionally, she now focuses her attention on family practice optometry as she enjoys being able to care for entire families -- from contact lenses, to disease management, to infant eye exams -- in a relaxed and informative environment. She is also a proponent of humanitarian work both nationally and locally; she has participated in a mission trips to Peru and aided in a free clinic in St. Louis monthly. Her passion for wellness flows over into her personal hobbies which include spending time outdoors with her husband, Dustin, her rescue dog Kuper, and cat Von. She also loves spending time with family and going to sporting events.